Your Business is Unique Your Internet Marketing Should Be Also! If your business is looking for a successful internet marketing campaign or web design assistance, you have landed on the right agency to achieve your goals. My team and I are of professional web designers, programmers, developers and marketing experts from around the globe. Together we have been exceeding our clients’ internet marketing expectations with our state of the art international experience and web design since 2005. My team’s global experience insures that you are provided the most up to date technology and ideas. These skill sets will set you apart from your competition, at an affordable price. Swoboda Marketing is located in Boulder, Colorado. Successful internet marketing requires a multifaceted approach. We offer unique web design, as well as cutting edge search engine optimization professional content writing, effective pay per click management, innovative internet marketing and engaging social media marketing. There is no avenue of internet marketing or web design that Swoboda Marketing will not take full advantage of in order to increase our clients presence. When it comes to design, editing or changes – you speak to me. You and I do them in real time sharing a screen! No complicated dashboard system or lengthy email detailing your requirements to compose. I do it with you, on the fly. I understand the pressures business owners face today. 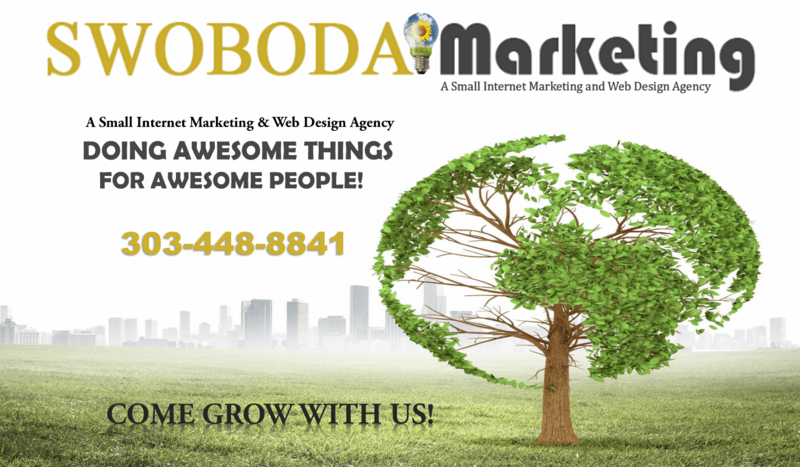 Reach out to Swoboda Marketing , you will be impressed with our expertise and our ability to listen to YOU. Laurie was fantastic to work with, she did a great job redesigning on our website, I would highly recommend! Laurie has done a great job! Highly recommended. In a word, Laurie is AWESOME! I have been in the IT industry for over five decades and rarely have I ever come across such a talent as Laurie. She gave me the insight and help I needed for a critical website of mine, as well serving as a wealth of knowledge about SEO and everything about Internet Marketing that I could throw at her. I highly recommend Laurie! It's been a full year now since Laurie designed and built my website. I'm constantly getting compliments on it, my search engine rankings are stellar, and this season my phone rang off the hook! Laurie's design and creative talent is fantastic and she REALLY knows marketing! Laurie is awesome. Always on it and thinking about how to help us get the best bang for your buck.She will not let you down. Laurie really knows her stuff. When a web developer I hired disappeared, she took over to finish my website, and did a wonderful job. Since then, she has been available for questions and website maintenance, and has made really helpful suggestions to someone who is clueless about SEO and web design (me). I would highly recommend her for her knowledge, willingness to explain things, and attention to detail. Thank you, Laurie!